Well, 2017 is coming to a close and this seems a good opportunity to look at the coming year in boxing. In particular, who might explode on the scene in 2018. Well, there are no shortage of talented young fighters set to emerge as world class contenders. But stepping up is one thing…winning a world championship is another. That takes more than just talent and skill…it takes connections, a world ranking and being at the right place at the right time. So with that being said here is my list of five fighters who I think meet all the requirements of becoming world champions in 2018. OK, most of you know I covered Dogboe’s fight against Javier Chacon in Accra back in July. The super bantamweight impressed me against the seasoned Chacon, who went into the fight on the heels of a five fight win streak and was undefeated since a loss in a fight for the WBA bantamweight belt in 2014. And after covering Dogboe’s last two fights and watching a half dozen more online what was most impressive is that the undefeated Ghanaian is improving with each fight. Now Dogboe is slated to fight for the vacant WBO interim junior featherweight belt against Cesar Juarez next weekend. So it goes without saying that I think he beats Juarez. But I don’t think it will end there in 2018. So am I picking him to follow up his win over Juarez with a win over undefeated WBO champion Jessie Magdaleno? Not exactly. In all honesty I don’t think he will be fighting Magdaleno at all in 2018. It seems clear to most insiders that Magdaleno is having trouble making weight and my prediction is that Magdaleno will vacate his world title and move up to featherweight. That means the interim champion becomes the WBO world champion. And I think that man will be Isaac Dogboe. It’s pretty clear to me that the former 2008 Olympic bronze medalist is making up for a lot of wasted time and I think 2018 is going to be his year. After competing in the Olympics in 2004 and 2008 his professional career was delayed until September of 2012 but initially it looked like he would make up for lost time when he won his first regional belt just three months later against the 49-fight veteran Humberto Toledo. He crushed Toledo in the opening round (capturing the WBA Fedacaribe title) and if you asked me then I would have said he should punch his way into a world title fight no later than 2015. Well, as is often the case in boxing his career never really took off and for awhile he looked to be the latest in the long line of talented Eastern European and Central Asian fighters who simply couldn’t register on the radar of boxing fans or the sanctioning organizations. But in the last two years Nelson Lopez and NelSons Promotions have done a masterful job of positioning Islam into the #1 ranking in the WBA and #2 with the WBO. Last month the WBA ordered Islam to take on #2 ranked John Vera Jr. In an eliminator and although I feel Vera is very much a live underdog right now I would have to give the edge to Islam. But as of yet the fight has not been announced. Now if that fight doesn’t materialize (just to stress, I have not heard anything to indicate it won’t go forward other than it has passed the WBA’s 30-day deadline, and with that being said I expect it to go to purse bids) there is an interesting second option: Dubai. You can stop searching Boxrec, I’m not talking about a fighter. I mean the city. Now Dubai has sadly earned something of a reputation in boxing as it always seems like there is a promoter or manager who was contacted by a “sheik” looking to pump a few million dollars of oil money into hosting a professional boxing event…only for the whole thing to end up being a pipe dream at best and a Nigerian email scam at worse. Most recently the Manny Pacquiao-Jeff Horn fight was nearly derailed when Manny was made an outrageously lucrative offer to defend his title in the UAE. Well, that turned out to be wishful thinking as there was no money behind the offer and Pacquiao decidedly to accept Horn’s offer to fight him in Australia. But I think the time may be right for Dubai to finally put the peices together for a world title fight and there are three fighters who I think would be a huge draw in Dubai: Manny Pacquiao (still to expensive), Amir Khan (still hasn’t fought since he was knocked out by Canelo Alvarez in 2016) and the new WBO 154-pound champion: Sadam Ali. Ali’s win over Miguel Cotto for the belt propelled him to the top of the world but I can’t help but think that had more to do with Cotto finally showing his age than Ali being a pound for pound contender. And from what I saw in Islam’s fight with Brandon Cook I think he beats Ali. If Ali does end up being the fighter who ends the Dubai boxing drought then I would expect Islam to be the most likely opponent for the Brooklyn native. Even if that doesn’t happen then it means he fights John Vera and then undefeated WBA champion Brian Castaño after that. Again, I see Islam winning both of those fights if he goes that route instead. Make no mistake, it’s been a long wait for Kanat Islam, but he is very much poised to finish the year with a world title. Ramirez is quickly emerging as one of the hottest young prospects in the sport and he is currently scheduled to fight fellow prospect Amir Imam on March 17, 2018 in a fight for the vacant WBC super lightweight title. Imam is an attractive prospect but Ramirez simply looks like a superstar ready to explode onto the scene. In my opinion Ramirez wins this fight…and wins the WBC belt. Now it would be easy to look at Calleros’s less than flashy record and close the book on him, but sometimes it’s about being at the right place at the right time. 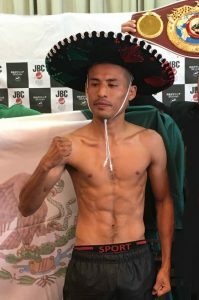 Calleros engaged in one of the best 105-pound fights in recent memory when he took on Tatsuya Fukuhara for the vacant WBO interim belt. Since then Fukuhara dropped a decision to the slick boxing Ryo Yamanaka while “Taz” clawed his way into a #4 ranking, winning three fights against limited opposition. But Calleros reminds me of a fellow Mexican who also racked up more than a few losses early on only to position himself into another title fight: Miguel Roman. Like Mickey Roman, Calleros combines relentless pressure with explosive punching power and like Roman “Taz” has shown a knack for never letting a loss hold him back. The interesting thing is if I were Yamanaka would avoid Calleros like the plague (Yamanaka has shown a suspect chin in the past) and fight the undefeated #1 contender Robert Paradero instead. Paradero cleary is a talented fighter but he is still somewhat green and he throws wide, looping punches that he tends to load up on. He’s only going to get better so the smart move would be to catch him early, before he refines his game. But reports from Mexico indicate that the champion is electing to go with Calleros, which I think is a mistake for the slick boxing champion. Because unlike Paradero, who throws wide looping punches, Calleros tends to throw short, compact bombs. And he throws a whole lot of them. If Yamanaka does go with Calleros for his first title defense I think the Mexican leaves Japan with the belt. This one is honestly a tougher pick for me and it’s tough for one reason: because I really don’t know how good WBO #1 ranked junior bantamweight Rex Tso is. Tso is undefeated (22-0, 13 KOs) and won the WBO International junior bantamweight title back in October against a tough 36-year old Japanese boxer named Kohei Kono. Kono had a solid career but it’s hard to gauge what he had left when he fought Tso (he lost two of his previous three going into the Tso fight). But back to my pick, Aston Palicte. None of this about Tso and Palicte would normally matter when looking for a future world champion except for one detail: Palicte is ranked #2 by the WBO and the champion, Naoya Inoue, will almost certainly move up to 118-pounds. Which means in a few months the WBO will order a fight between the next two availble contenders for the vacant world title. And right now that is Tso and the Filipino puncher Palicte. And right now my gut tells me Palicte wins that fight. He clearly has improved tremendously since his last loss to Junior Granados in March of 2016 and he seems to be in the zone ever since he scored the upset over undefeated Oscar Cantu for the NABF belt in December of 2016. Tso may be the real deal, but he hasn’t fought a fighter like Palicte yet and I think the Filipino will be the man holding the WBO belt over his head in 2018.